We celebrated our 125th Anniversary on Sunday August 13th! Stay tuned for photos! The church was organized on August 7, 1892 as La Iglesia Presbiteriana de El Rancho. Church before the addition of the Fellowship Hall. 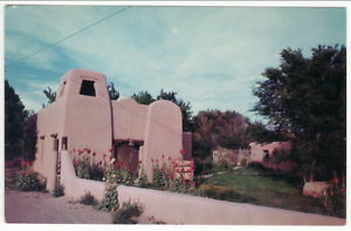 La Iglesia Presbiteriana de El Rancho was an outgrowth of the mission school established by Alice Hyson in June of 1884. The Alice Hyson School educated local children through 8th grade until it closed in 1958. In April 1892 the Presbytery of Santa Fe appointed a commission to organize the church. The church was organized on August 7, 1892 with J. M. Whitlock as the first minister. J. M. Witlock served from 1892 - 1898. The Organizing Members are listed below. The current Church Building was built in the mid 1930s. The old Church Building (two buildings north of the current Church) became the Alice Hyson kindergarten and was used for Sunday School. The new Fellowship Hall was dedicated on August 9, 1992. The Alice Hyson Museum is housed in the church offices. Ranchos Presbyterian Church currently owns and rents out two additional buildings: the Manse just east of the Church and the Midwifery just north of the Church. Rev. Porfirio Romero is the father of Louise Trujillo and Eleanor Romero. The family of Amador Martinez recently visited Ranchos Presbyterian Church.